Gloria started dollmaking about 20 years ago after her daughters gave her some doll-making fabric and encouraged her to try making dolls. 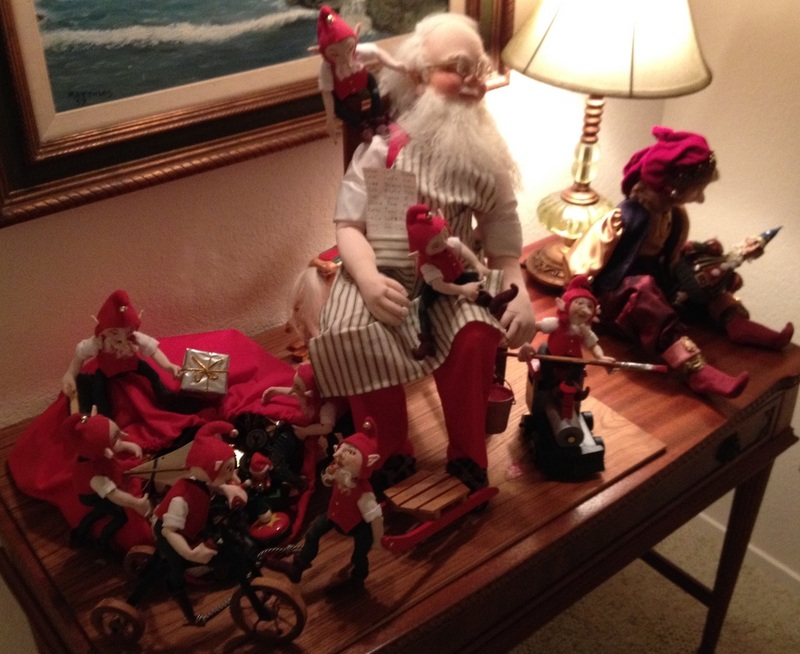 Gloria recalls that the first doll was a disaster. She learned the hard way about the “give” of the fabric. That setback did not deter her. Gloria worked for the first 10 years with patterns but has gone on to create and each doll her own. In an effort to create dolls with a profile, Gloria learned how to use paperclay and sculpey to achieve the desired effect, bringing a wonderful realism to her dolls. She says, “The faces just make themselves. I have an idea when I start and this is how they turn out.” After creating the basic doll, she adds makeup, makes the clothing, and adds hair and other accessories. This traveling exhibition sponsored by the Great Lakes Seaway Trail features 26 quilts, newly-made, but true to 1812-period quilting patterns, fabrics and colors. Interpretive panels tell each quilt's "story"--some real, some imagined--and its relevance to what many historians consider America’s second war for independence. The Great Lakes Seaway Trail is a National Scenic Byway that follows the St. Lawrence River, Lake Ontario, Niagara River, and Lake Erie in New York and Pennsylvania. Much of the War of 1812 was fought along this strategic freshwater shoreline. 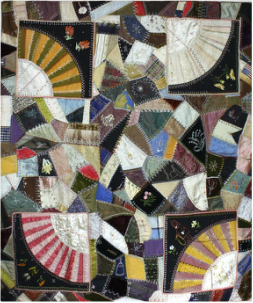 The theme of this quilt challenge, which was held in 2012, inspired quilt makers in both the United States and Canada to learn more about the struggle for North America and to interpret the War's Bicentennial in many interesting and personal ways. Quilting is two-dimensional medium, but I like to play with the illusion of three. My quilts have a sense of depth that goes beyond the surface. Elements seem to float above the surface or recede into the depths of the quilt. My goal is to encourage the viewer to look into the quilt, rather than just at it. Beyond the illusion, my quilts have something to say. 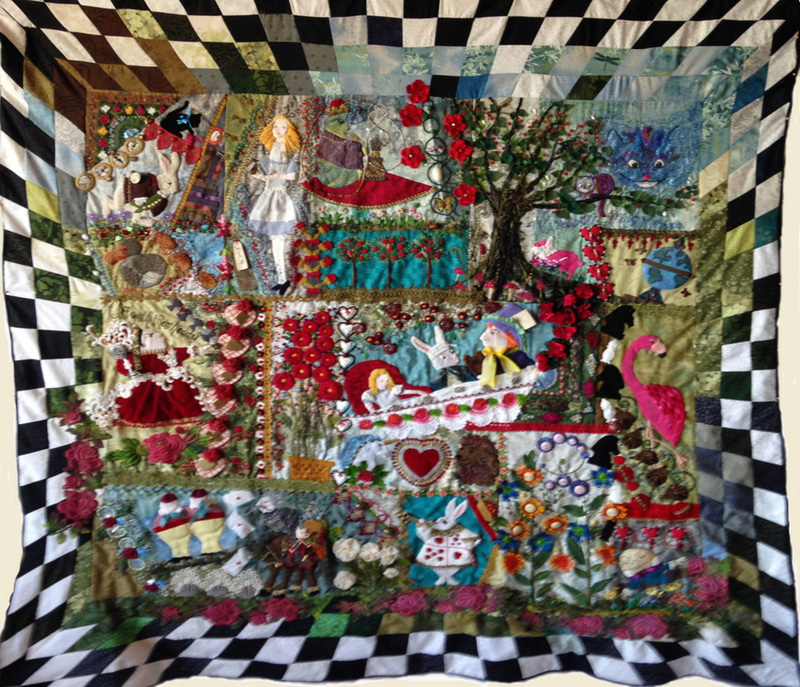 They say that every quilt has a story and that is true of my work. I'm compelled to assign a private narrative to every piece. I tend to start with a title (and story) and build the work from there. I'm inspired by walking through old cemeteries and studying the architecture of the headstones and the play of light on the granite. I tend to pull leaves off trees. I'm fascinated by the stars and planets, and I never miss an opportunity to look through a telescope. I love geometry but not necessarily symmetry. These themes and more end up in my work. I create illusion by casting shadows, and by doing so I create light. The first floor of the Gaches Mansion hosts the blue ribbon quilts, wearables, and fiber art from our 2015 Quilt & Fiber Arts Festival. On exhibit will be Best of Show and all the top entries in each category; plus the pieces that have been given an Award of Excellence. 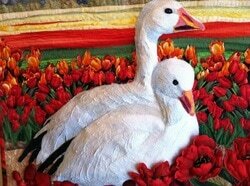 Whether your passion is traditional quilts, art quilts, wearable arts or fiber arts, there are many fine examples on display. This is your opportunity to really study the designs and techniques of talented contemporary artists. Each participant received a quarter yard piece of Kate Spain’s Serenity Collection and a fat quarter of American Made Brand #07 Dark Grey, donated by Clothworks. Even though artists were using the same fabrics, many different creative techniques and designs resulted! 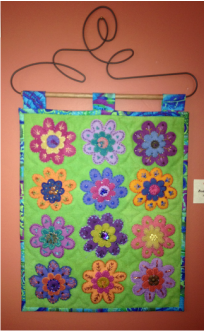 While many of the pieces are for sale, they will remain on display through our Quilt & Fiber Arts Festival, Oct 2-4. Come and see the work and vote for your favorite! Thank you to Julie Anderson (Festival Chair) and Clothworks for their donation of fabrics! Also on exhibit is "Sparks of Spargo," pieces created by students of last year's Sue Spargo Workshops. 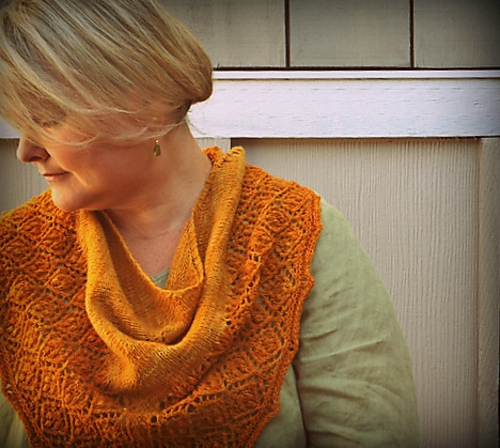 Featured Artists: Martha Kleihege of San Francisco, CA, Susan Lenarz of Mt. 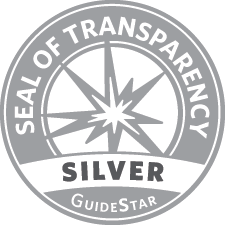 Vernon, WA, Karen Nelson of Hettinger, ND, Alba Romero of Seattle, WA, Jill Taylor of Vancouver, BC, Maria Winner of Portland, OR, Deborah Zibrik of Vancouver, BC. This innovative, contemporary art showcases the individual artistic journeys taken by Graduate Students of the Gail Harker Center for Creative Arts. 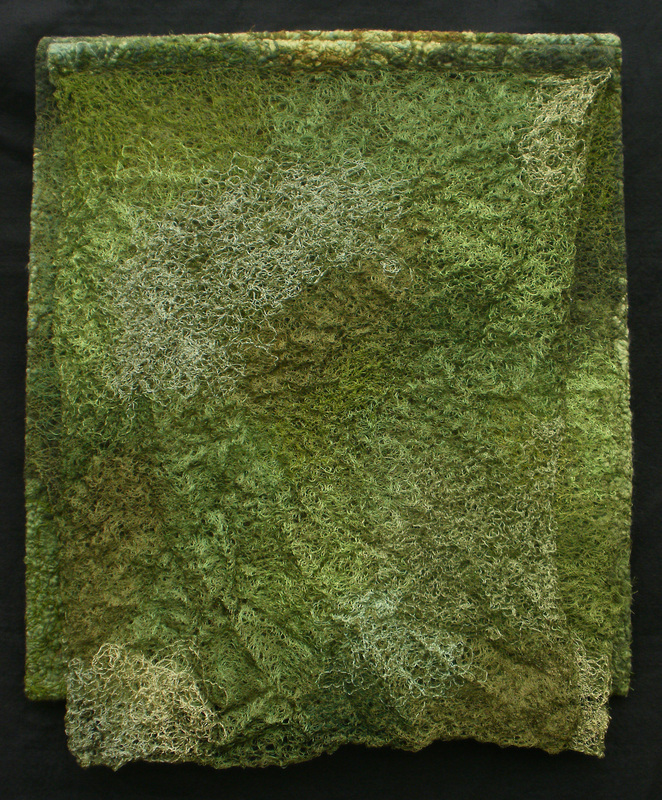 Multi-media textile work is derived from personally developed themes by each artist. 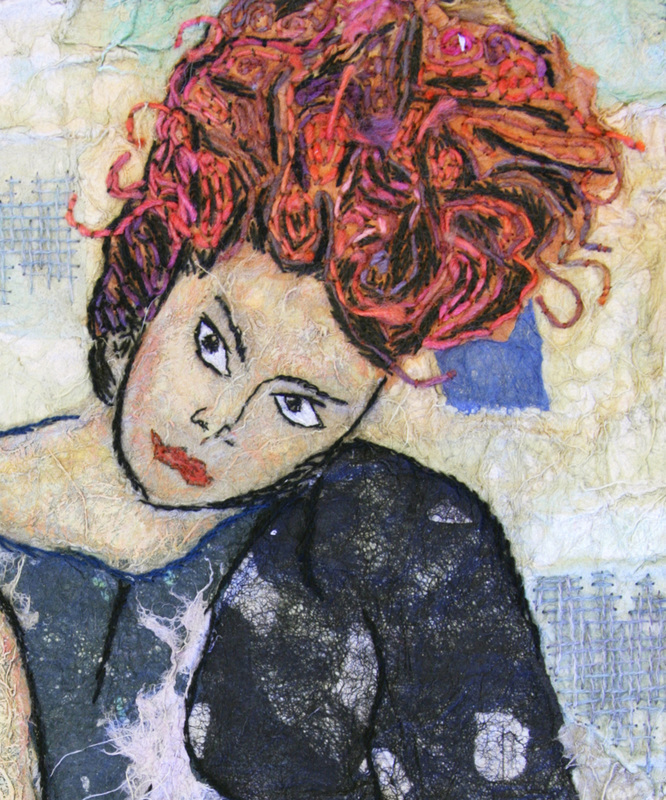 These Artists have completed the highest level of training: Level 4 Studies in Experimental Stitch and Multi-media. The exhibit marks the 20th Anniversary of the Center, where Gail Harker continues to teach Art & Design and Stitch. Located in La Conner, WA, the Gail Harker Center for Creative Arts offers courses in Textile and Multi-media Art. Since its founding in Washington State in 1994, the center has provided instruction, coaching and mentoring to more than 2500 textile and design students. The center provides a rich, inspirational environment dedicated to the development of individual creative expression within a contemporary context. Learn More at: www.gailcreativestudies.com and visit Gail’s blog at: http://www.gailcreativestudies.wordpress.com Gail Harker Center for Creative Arts is a Washington nonprofit that is applying for tax exemption under IRC 501(c)(3). Since 1982, I have been a quilt maker, i.e., my work is constructed from layers of fabric, stitched together with batting or other filler between the layers. I love the tactile qualities of cloth, and the unlimited color range made possible by hand dyeing and other surface design techniques. My quilts begin with white, 100% cotton fabric. The fabric is dyed, painted and printed to create the palette of colors and visual texture used in piecing and appliquéing my images. Textures, created by layering, pleating, embroidering, and quilting, invite the viewer to touch, as well as look. In addition to my ongoing series of colorful fantasy works, I am also making a series of quilts from images scanned and manipulated in the computer and printed directly on fabric with archival ink jet inks. The focus of my work is on the qualities of color, line, and texture, which will engage the spirit and emotions of the viewer, evoking a sense of mystery, excitement, or joy. Illusions of movement, depth, and luminosity are common to most of my work. The inner glow is created by hand dyeing or painting my fabrics in gradual progressions from light to dark. Both my geometric color studies, and my more organic, curved seam abstracts are inspired by visual impressions, collected in my travels, in my everyday life, and in my imagination. 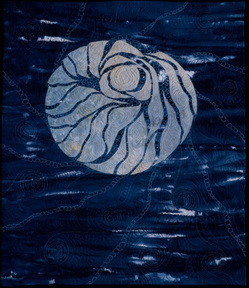 Caryl Bryer Fallert-Gentry is internationally recognized for her award winning fine art quilts. The westward expansion of North America in the 1800s gave rise to a new type of quilt, the Album Quilt, which could contain pieced and/or appliqué work and perhaps sentiments and/or signatures. As families parted, quilts were given as remembrances to the departing loved ones. Some of the most exquisite examples are the Baltimore Album quilts, made in Maryland from 1840-1855. This style of quilting spread quickly to surrounding states, where the maker would interpret the style with their own patterns and colors. One such piece can be seen this summer at the Museum. 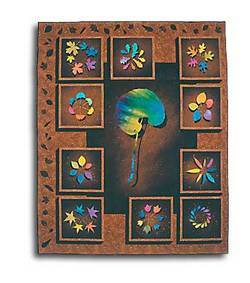 It is a counterpane (single-layer construction) with hand applique elements that feature trapunto work (stuffed work) and quilting. Appliqué Album with trapunto work and hand quilting made by Martha Wickham in 1856. Block #17, Strawberries with leaves. Katherine Lewis is a basketmaker working on a farm in the Skagit Valley near Mount Vernon, Washington where she grows a large selection of basketry willows. Growing her own materials allows her to choose from an array of natural colors and weaving qualities. 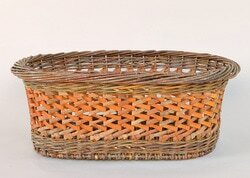 Her goal is to weave baskets that are functional and durable while reflecting the natural beauty of the willows. Katherine weaves baskets using traditional European stake and strand willow basketry techniques and the hand tools of the craft from field to finished pieces. She hopes to preserve these traditional willow basketry skills while rooting her craft in our Pacific Northwest landscape. She has traveled several times to Europe to study the basketmaking traditions and explore the willow growing areas. Her primary materials are the willow rods that are harvested annually in the winter months. The willows are coppiced or cut back to the stool near ground level. Most are slender one year old rods, but some are older for producing the necessary larger sticks. Willow bark is peeled in the spring and summer from larger rods that have been grown for several years before harvest. 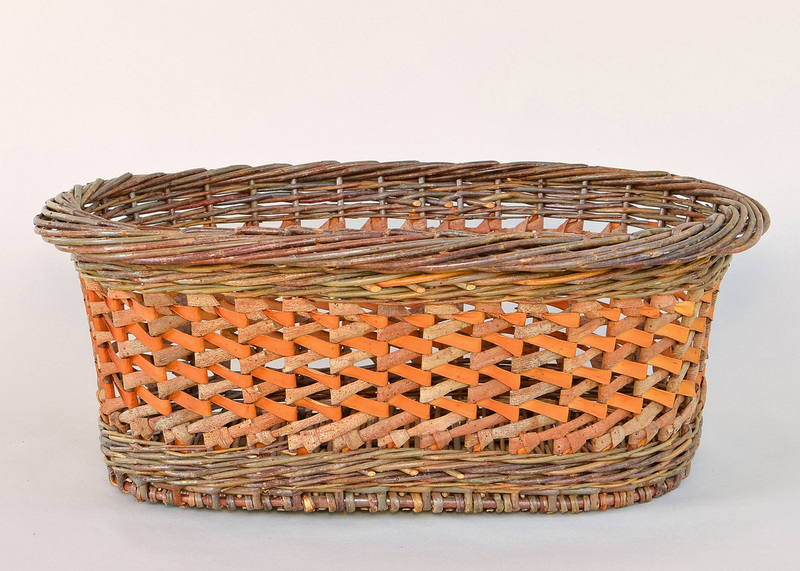 The Renwick Gallery at the Smithsonian American Art Museum acquired several of her baskets in 2011 as part of the Cole Ware Collection of American Baskets, which documents the revival of traditional basketry in the United States during the past fifty years. 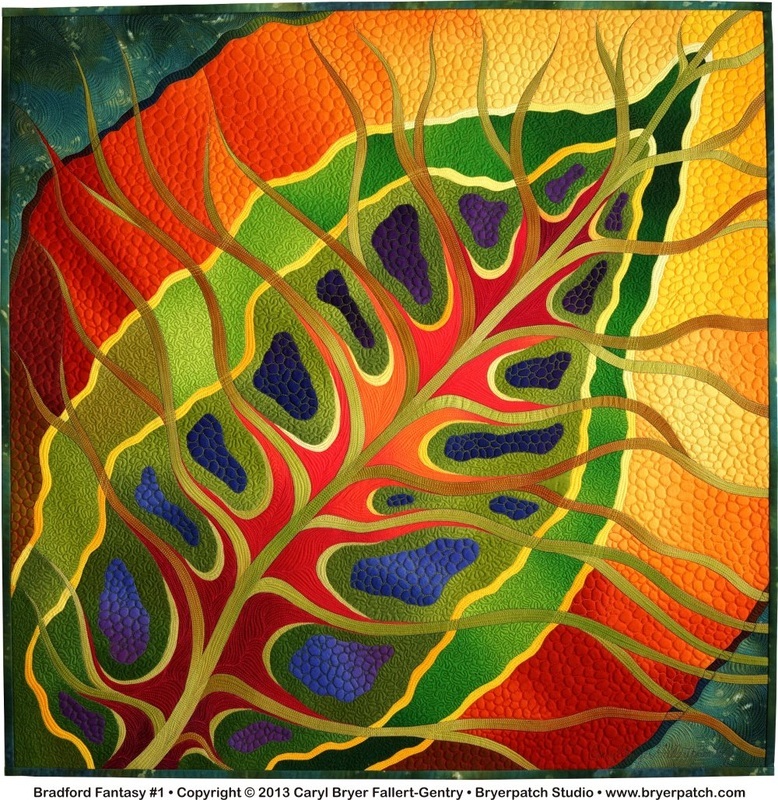 The Contemporary QuiltArt Association (CQA) is a group of more than 100 Washington State artists that work with fiber, thread and textiles. CQA artists are diverse in style, materials, and techniques, often inventing new ways to stitch or manipulate fabric. They use a variety of materials including silk, linen, cotton, wool, plastic, vinyl, roving, rayon, or paper; rubber, zippers, feathers, beads, metal; yarns and threads, dye, paint, pens and more. Materials may be new or recycled. The inspiration for Impressions in Fabric is the beautiful landscape of the Western United States, from Antelope Valley’s Poppy Reserve in the south to the aspen forests of the Sierra Nevada and to the Pacific Northwest. The techniques used in the show are perfect for depicting the larger landscape, as well as the more intimate landscapes and florals. The primary technique used on the fabric landscapes is reminiscent of the pointillism of the neo-impressionist painters, Georges Seurat and Paul Signac. Where they used dots of paint, the quilting technique uses tiny pieces of fabric. The process starts with a backing and batting, creating a “canvas support” for the landscape. Fabric color choices are made, and then the fabric is cut into small pieces of fabric (approximately ¼” in size) using a rotary cutter. 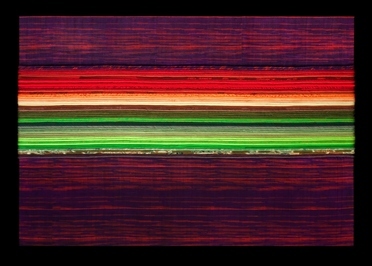 These pieces are stacked into piles of related colors, similar to a painter’s palette. The design is then sketched loosely on the batting. The colors are then sprinkled onto the batting to create the image. 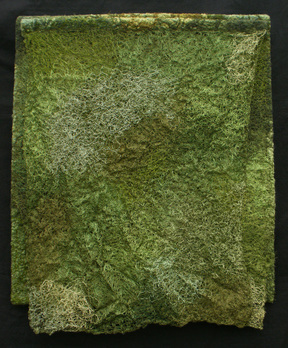 Some larger pieces of fabric are used for different elements such as tree trunks and branches, architecture, sky, etc. Once the surface is completed, the entire quilt is covered with tulle (fine netting), pinned together, and heavily quilted. The quilting provides several functions: it holds all the pieces together so there is no shifting of the fabric; it adds definition; and it makes the landscape come to “life.” The binding on these pieces is sewn as a facing. 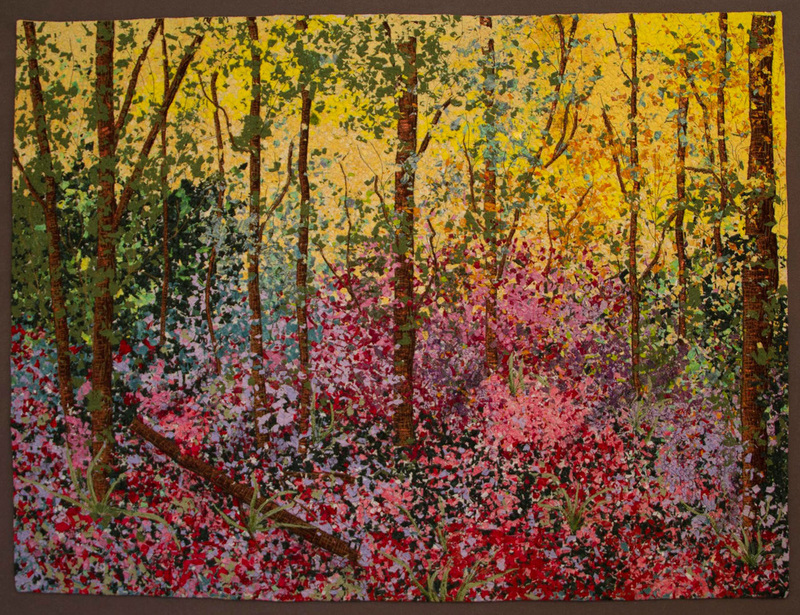 The second technique in the show, fusible appliqué, is used mostly on the floral quilts and in parts of some of the landscapes. This technique consists of creating a line drawing of the finished shapes and copying this drawing onto a 2-sided adhesive sheet. The shapes on the adhesive sheets are cut out and ironed onto the backs of the appropriate fabric. The fabric shapes are then cut out and ironed onto the background fabric. Once all the pieces are ironed on, the piece is placed on top of the backing and batting, quilted, and bound. Denise Oyama Miller and Nancy Ryan have been quilting for many years. They met on a soccer field when their sons were playing on the same team and have been quilting, taking art quilting classes, and showing their work together ever since. In 2013, Denise and Nancy were co-Featured Artists at Empty Spools Seminars at Asilomar Conference Center in Pacific Grove, California. Every spring, the fields surrounding La Conner are filled with bright colors. Beginning in March with the iridescent yellow daffodils and continuing through April with the varied tulips, our lives in this part of the world are alive with color and they have inspired our first floor displays. Quilts made during the 1930s Depression brightened the lives of the makers and their families. A favorite hexagon quilt will be on display this quarter, a beautiful Mosaic Quilt. This quilt features hexagons formed into diamond blocks that are arranged into a Tumbling Block setting. This quilt is all hand pieced and hand quilted, as will be many of the quilts on display. 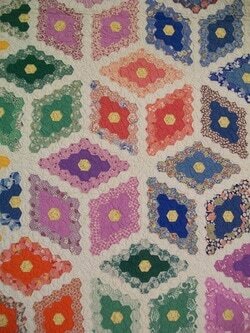 The hexagon patches were one of the earliest patterns used in patchwork with roots in 18th century England. At this time in history the patches are sewn together in a method called English paper-piecing. First one bastes a paper hexagon to fabric, folding the seam edges in; then, then placing right sides together, one whipstitches along the edges. This allows sewing of very small pieces. Quilts made in the US during the 1920-30s are most often pieced with a running stitch. Quilting during this time period often follows the patch. Kitty Pippen was born in Ping Ting Chow, Sahsi, China, where her parents were missionaries. Her appreciation of fine needlework comes from many childhood hours spent watching the Chinese women mend and quilt their padded garments and do embroidery. After coming to the United States for college, she married and subsequently moved to California where she and her husband raised their family. For many years, Kitty worked as a draftsman in the bio-chemistry department at UC, Berkeley. During that period, she discovered Japanese fabrics and bought a few pieces, which she set aside until retiring to Lake Almanor, California. There she “unearthed” the fabric and made her first Japanese quilt. Since then, she has continued to educate herself about Japanese textiles-how they are designed, dyed, and woven. In her words: ‘The more I use them, the more passionate I am about working with them... and I want to own every variety. It gives me great joy to share my love for these fabrics by teaching classes and lecturing at quilt guilds’. “ Quilting with Japanese Fabrics, That Patchwork Place. 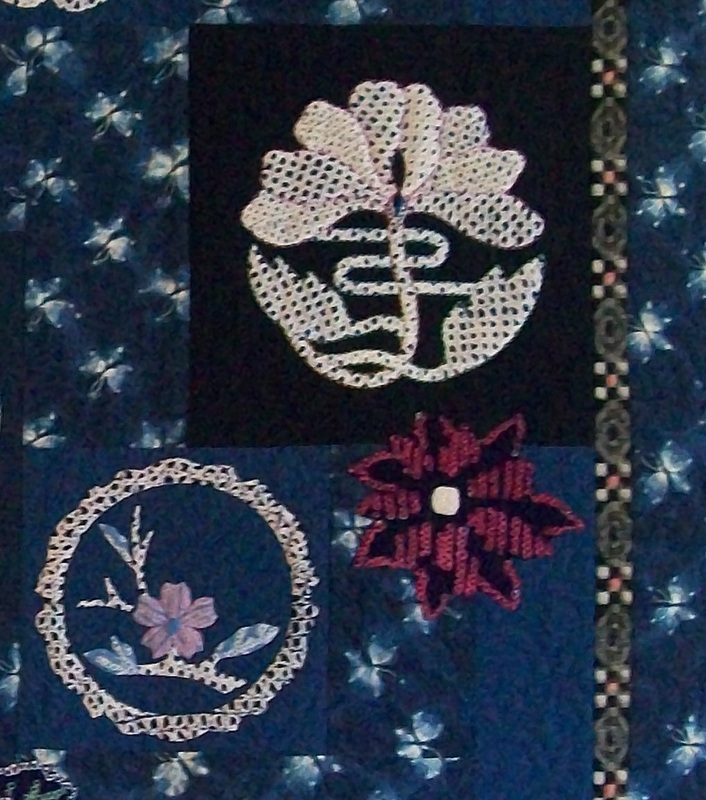 Kitty's quilt, Shibori, detail shown above, won First Place for Innovative Applique at the 1994 International Quilt Festival in Houston, Texas. It combines appliques of both raised and ironed pieces of shibori fabric and has details of sashiko stitching and other hand quilting. 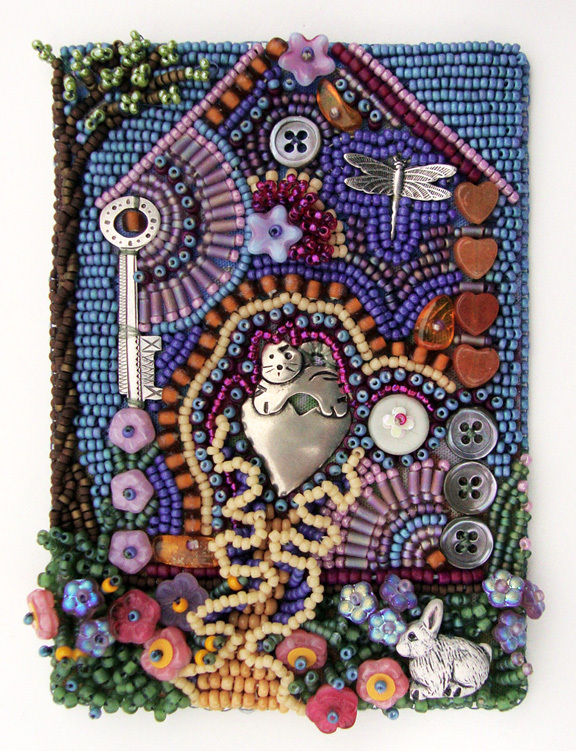 Please join us to see the work of local bead artist, Robin Atkins. Robin enjoys all types of beading. 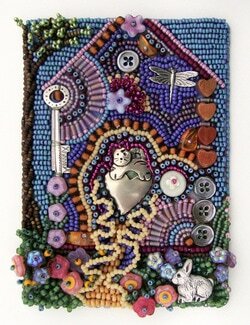 She especially loves to sew beads on cloth, creating wall art and quilts, as well as sculptural pieces. 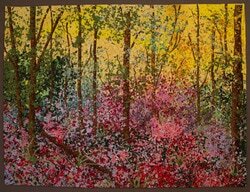 Currently her two passions are designing wall art using her eco-dyed fabrics with bead embroidery, and creating personal quilts which visually journal her thoughts, experiences, and feelings. She is excited to see the development of beadwork in the past two decades, as it has shifted from the world of craft toward the world of art. Traveling widely to teach, lecture and research beadwork for over 25 years, Robin Atkins is a nationally known bead artist. She has authored eight beading books, including her latest, The Complete Photo Guide to Beading, published by Creative Publishing International, and numerous magazine articles. "It has long been a fascination of mine that the best ideas or solutions to problems always seem to present themselves at highly inconvenient moments: driving down the freeway, in the shower, anytime I can't just drop everything and get to work. What emerged were some recurring themes that turned into some short series that are presented in this exhibit: Shattered Circles (a continuation of a long term series), Labyrinths and Celtic Spirals, Gaia/Goddess Figures, and Trees, as well as a goodly collection of non-series works on a variety of themes. I start with dyeing (and sometimes painting) my own fabrics, but also use commercial batiks. 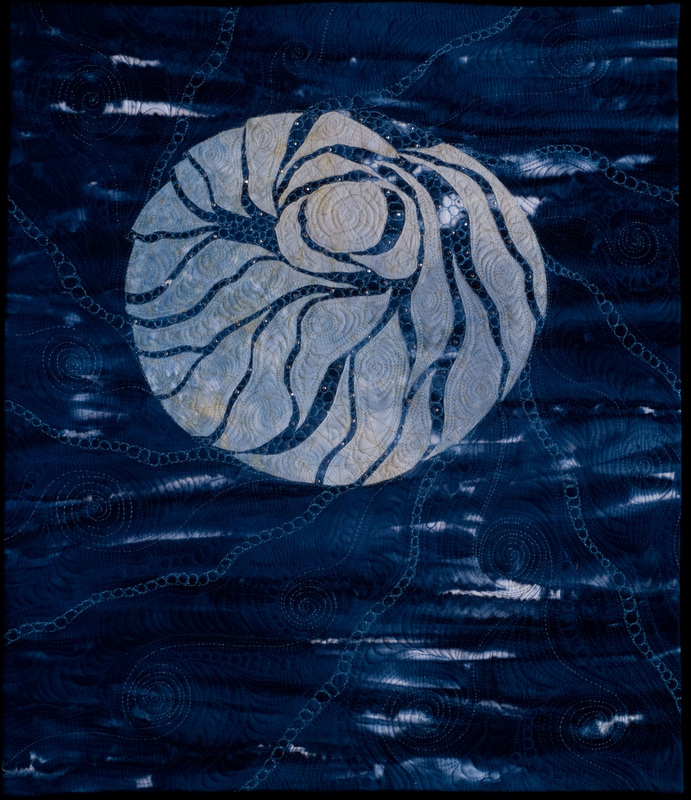 The backgrounds are either whole cloth or fused collage, on top of which are placed the design elements - the shattered circle, spiral, or figure. I love the quilted line, and use a lot of thread to cover the surface with stitching by machine. When the machine work is complete, I add whatever embellishments are needed. Sometimes this is couched fibers, but mostly this would be the beadwork. The beading can be added right to the quilt, or can be created as a separate medallion and added to the surface just like any applique piece. The backs of my artwork are generally not pretty and involve long stitches for the embellishment techniques, so I add a secondary back to protect those stitches from snagging. I work intuitively, and don't do a lot of sketching or planning except to capture an idea that arrives at an inconvenient moment." 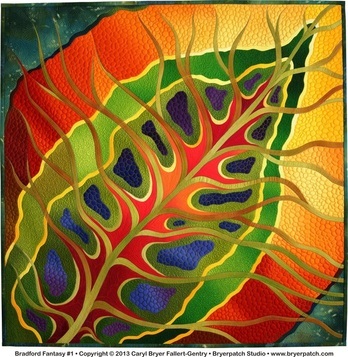 Frederica “Freddy” Duffy Moran is an artist and author known for her unbridled use of bold color and original designs. She considers red to be a neutral. And, of course, there is always black & white, and purple, and shocking pink! Freddy’s love for quiltmaking began later in life, at age 60, after she had excelled at other art forms. She obtained a BA degree in ceramics from the Dominican College in San Rafael. While raising a family of five sons, she designed and taught needlepoint at the Orinda Art Center, Orinda Community Center, and at her local needlework shops. 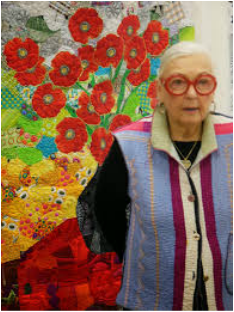 Her quilts have appeared in national and international publications, including magazines, art books, calendars, text books and quilt books. She is the author of Freddy’s House: Brilliant Color in Quilts (C&T Publishing, 2011) and co-author of Collaborative Quilting (2006) with Gwen Marston. Freddy is a popular teacher, lecturer and award-winning quiltmaker. She has been selected by Home & Garden Television (HGTV) as one of six artists nationwide for their “Artists in Residence” special, which aired in early 2002. The program featured artists who “live their work” and includes a potter, a woodworker and other crafts persons, but Freddy is the only quilter. 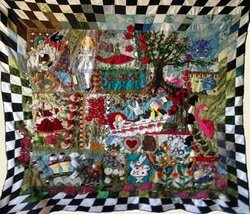 This program showed Freddy in her Orinda, California, home and garden surrounded by things she loves—quilts, a garden and extensive collection Majolica pottery. American Quilter magazine featured Freddy in the Winter/2001 issue. There is a recent article about Freddy in the American Quilter's Society magazine (2014). Crazy quilts were popular from 1880-1920s; the earlier quilts are often made of silk fabrics and are embellished with a wide variety of embroidery stitches. There is also a rise in embroidery work on tablecloths, doilies, and everyday items. Redwork embroidery became popular for linens and quilts by the end of the 19th century. "Penny Squares" could be purchased for a penny (hence the name) and were readily available in stores. Using the red thread which had in the past been used to mark linens, these embroideries were simple line drawings that even children could do. 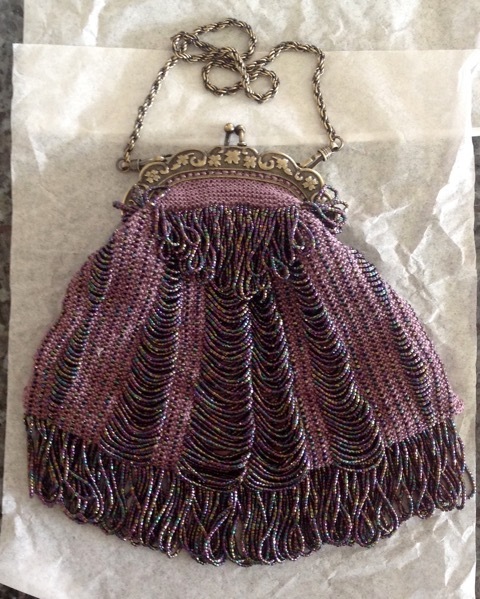 We have a special garment on display, made by Florence Blackington of Guemes Island in the late 1920s-1930s. She used a gossamer fabric and beautiful embroidery work, even including smocking and pulled thread work on her lovely mint green flapper dress. Embroidery work continued in the 1930s with a large variety of patterns made available through newspapers, magazines, and by mail order. 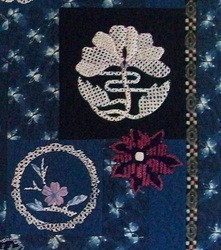 One popular style was using black floss to outline applique patches. Artists: Jacque Chase, Carol Harrington, Amy Green, Jane Hyde, Fran Jepperson, Lori Maul, Anita Luvera Mayer, Emily McNeil, Jude Middleton, Linda Peterson, Shannon Woodall, Kelli Wyll, Melissa Wyll, & more! Take a glimpse into the world of creative knitting. Hand knitting is most often done using yarn and knitting needles to create an interlocked fabric and that is where the fun begins. 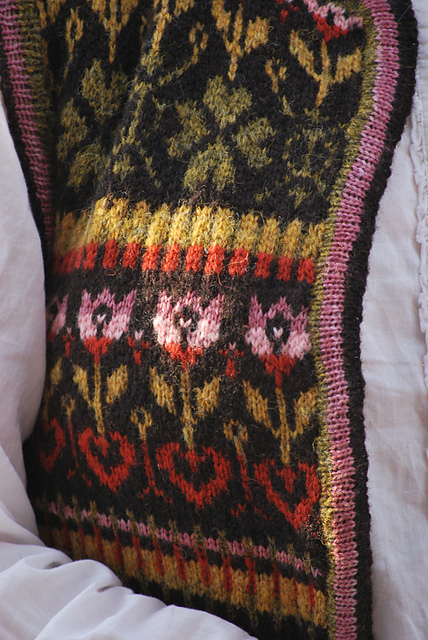 Manipulating the yarn allows the knitter to vary the stitching to include colorful patterns, lacy edgings, and even beadwork. At times, knitting is used as a wearable item but may also be used as an element on a finished garment. Working with commercial or original designs, the work reflects the artists’ choice of yarn, stitch patterns, embellishment or other modifications that reflect their creative spirit. Fiber artist, Sally Schoenberg. Sally makes bobbin lace. 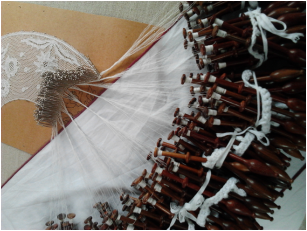 Bobbin lace was first made in Italy in the 16th century. This lace is made using multiple threads, which are woven, crossed, and plaited to form a lace textile. Each individual thread is wound on a bobbin to aid in controlling the thread when creating the pattern. Sally introduces us to four different varieties of bobbin lace: Torchon, Bedfordshire, Binche, and Ground Point. These four laces are all quite different in style. Torchon is the most simple and is considered a beginner's lace. Fans of the TV series, Downton Abbey will recognize the Bedfordshire Bobbin Lace as the lace worn by the older women of the family. Binche (pronounced Bash) is a very delicate lace made with extremely fine threads. Ground Point features a net background with fancy stitches and honeycomb designs; it often includes a heavier gimp thread to outline the designs. 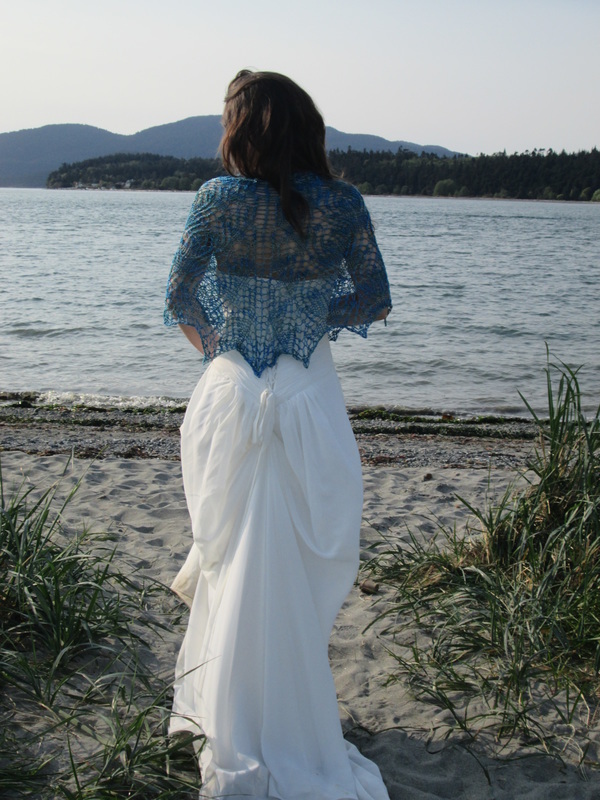 Sally Schoenberg has been teaching lacemaking in Alaska, the Pacific Northwest, and at International Organization of Lace conventions since 1991. Her greatest enjoyment, second only to making lace, is seeing a student go from frustration and bewilderment to "Aha! Now it makes sense!"